When it comes to color, we've grown to accept a certain regular pattern from spring and summer: soft, dainty pastels for the former, and loud, juicy brights for the latter. 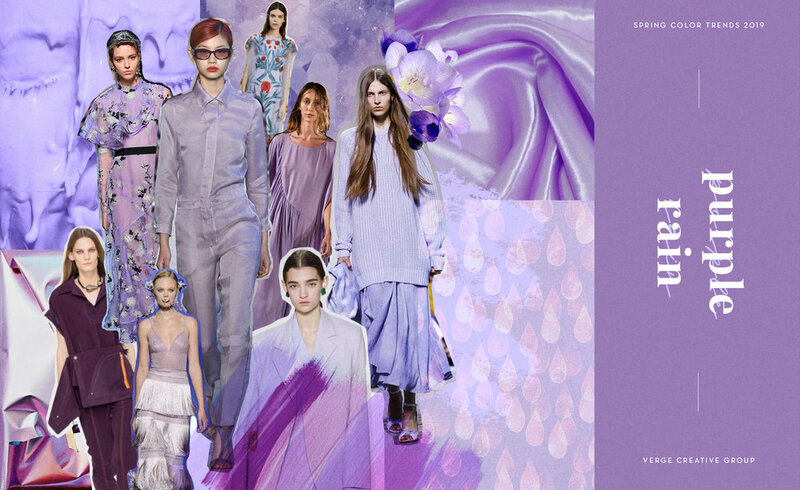 Though these time-tested color trends aren't going anywhere anytime soon, the colors of note that are forecasted for SS19 include more surprising choices. These are more thought out and much more forgiving in nature — think mellow, oceanic blues; lavender purples; and light-infused earth tones channeling the softest touch of millennial pink. The shift from bold to beatific may be for a reason: in a time of sociopolitical upheaval, we are increasingly looking inward, outward, and upward. Showiness and grandiosity are scaled back in favor of social connection, and in art, music, and pop culture, love and acceptance are more than a marketing tool — they're a driving force of creation and a mode of being. 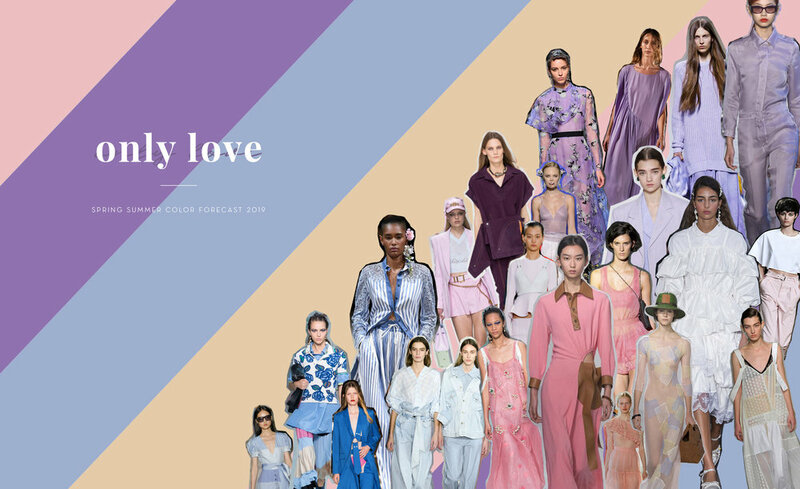 The heart-centric colors of SS19 are soft but deep, outreaching and introspective. Below are the top four colors we see making waves in the coming seasons. 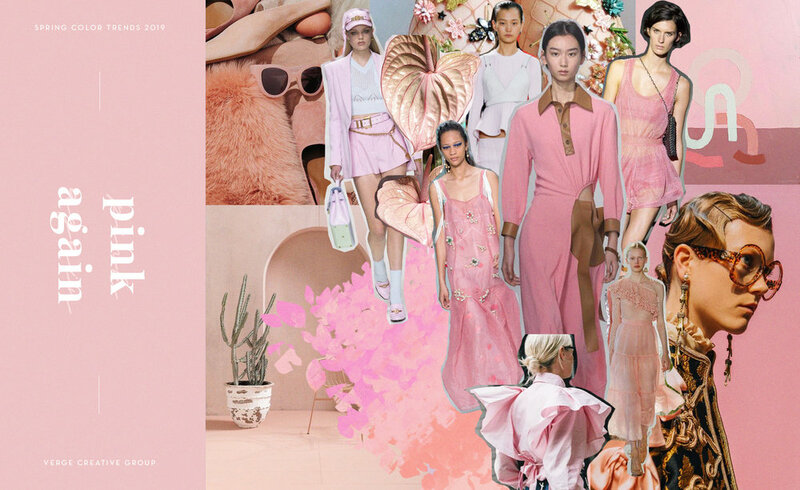 Much like Lady Gaga's pink hat on the album cover of Joanne showed us the softer side of Mother Monster, the on-trend pink for SS19 is a blend of subverted suburban charm and upscale hip mentality, a blend of coral, peach, and the ubiquitous millennial pink. While this color once brought to mind forced femininity and domesticity, the deeper-than-angelic hue has since become an invitation to daydream (unicorns, anyone? ), a rejection of gender roles, and a softening of sensibilities, reassuring us in an emotionally draining age that it's okay to be ourselves — and more importantly, to let ourselves be happy. Much like Iris Murdoch's beloved novel, The Sea, The Sea, oceanic blues lend a more pensive mood to the tropical feel we see during most summer seasons, as the blue wash of deep thought — Picasso had a blue period for a reason — overtakes a season of traditionally Pucci-esque florals and neo-neons. Inspired by Japanese artist Jun Kaneko's abstract, surrealist ceramics, the heaven-reaching blue inspires introspection, with all of the softness of baby blue and none of the innocence. Paired with gauzy chiffons and loose-fitting linens, the shade is nothing short of spiritual. A heavenly feel is definitely in the air for SS19, with various iterations of vibrant pearls, creams, and albatross-inspired whites with the tiniest glints of gold taking center stage. No longer relegated to the safe and (dare we say) boring neutrals, white is gifted with loads of taste and texture in knits, sunbleached linens, and natural finishes. Married with earth-evocative materials that invite touch and feeling, it lends a new meaning to the concept of purity. We're still not over Prince's passing, and neither, it seems, is the fashion world. Purple, the lush color of royalty, is having another moment in sensuous violets and sweet, airy lavenders. Associated with rest and rejuvenation — as cultural interest in aromatherapy grows, lavender continues to be the top-selling essential oil — the soft but strong color evokes a sense of internal power and everlasting life.